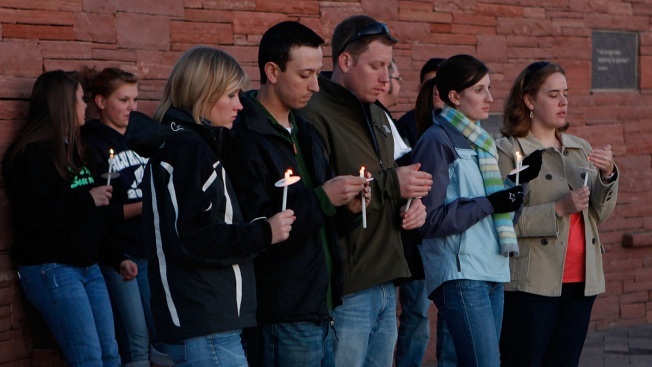 In this file photo, family and friends gather at a candlelight vigil at the Columbine High School memorial at Clement Park, near Littleton, Colo., on Sunday, April 19, 2009. Families of the Columbine High School shooting victims gathered at the school on Saturday to tell their stories 20 years after the tragedy, and they spoke of forgiveness, inclusion and healing, and the balm that sometimes only silence can bring. It was on April 20, 1999, that two Columbine students gunned down 12 classmates and a teacher in the Denver suburb of Littleton. A dozen parents, siblings, former students and others who suffered through the ordeal met with reporters ahead of next month's anniversary. Here are some of their stories. Darrell Scott was thinking about forgiveness Saturday. Darrell and Sandy Scott's daughter, Rachel, was killed at Columbine, and they founded a program called Rachel's Challenge in her honor. One principle the program teaches is forgiveness, a path the Scotts chose after Rachel was killed. "It was a difficult choice, but it's enabled us to help students who are struggling with issues in their own life," Darrell Scott said. Forgiveness frees you, Scott said. "And if you don't forgive, you're going to be unforgiving and bitter and angry and seek revenge," he said. The Scotts' son, Craig, was also a student at Columbine and was at the school the day of the attack. He worries that school shootings have become "a part of the American psyche." "The formula, unfortunately, is, you're bullied at school, so maybe you're going to do a school shooting," said Scott, who has an organization called Value Up and speaks to students about valuing human life and not turning to violence. "If you're bullied at school or harassed, that's wrong," he said. "But that's also temporary. ... When you choose to go and end somebody's life, that's permanent. That's a permanent judgment." Frank DeAngelis, who was Columbine's principal at the time of the shooting, wondered aloud how the killers grew so hateful, and whether part of the answer was that they felt excluded. "We talk about things to make schools safer," he said, including security cameras and metal detectors. "But the thing you can't underestimate is making everyone feel welcome, inclusiveness." Schools are becoming more inclusive, he said, but now they have to fight cyberbullying. "That's the thing that scares me," DeAngelis said. "Now, when someone posts something on this phone, it's there forever, and these kids feel their lives are destroyed forever." Missy Mendo and Heather Martin were Columbine students who escaped the attack physically unhurt, but the emotional trauma kept them away from the school for years. "I struggled a lot after Columbine," Martin said. She eventually ventured back to the school on the 10th anniversary of the shootings, in 2009, but Mendo had not returned before this year. Mendo and Martin helped found the Rebels Project — named for the Columbine High School mascot — to help other survivors of mass trauma. That work helped Mendo gather the courage to return Saturday. "Helping others, knowing that you help them with steps that you had to help yourself through" allowed her to go back, she said. "And knowing that when we were coming here today, we would be able to let other people know we were here if they needed us." For Tom Mauser, whose son Daniel was killed at Columbine, the 20th anniversary will be just another day, and a bad one. "We live it every day," he said. "It's a remembrance that we have every day that we lost our son, just like anybody who has lost a child." But he appreciates that other people want to honor the victims and ask how the survivors are faring. More meaningful than observing anniversaries would be to ask whether society will act to prevent school shootings, Mauser said. "What resolve do we have to stop this from happening again?" he said. Rick Townsend, whose daughter Lauren was slain at Columbine, was thinking about kindness and recalling the outpouring of support that the families felt from people around the world. "There was a time then when people were saying, 'You know, we really need to be nicer to each other. We need to support each other,' " he said. "I think that over time some of that's been lost, and I'm not sure why." Dawn Anna, Lauren Townsend's mother, said she finds solace by helping others through tragedy. The most important thing, she said, is not to talk but simply be present. She learned that from a friend she described as a "motor mouth" who came to her house after the Columbine shootings but — to her surprise and relief — said nothing. She only sat with her, occasionally getting up to get her a glass of water. "Don't say anything, because there's not a single word you can say that's going to mean a thing," Anna said. "And then when they're ready, or if they ask a question, then you can start to talk."